It’s May in Connecticut and your pool is looking sparkling clean. It’s one of those hot spring days and you are itching to dive in. So you do. And then to your dismay you realize the pool water is COLD. Only small children would want to swim is this water! Many a New England pool owner has been dismayed by water temperatures in early spring and late fall. But what do you do? Will a solar cover for your pool really help? We talk to lots of pool owners and we hear what techniques work and don’t work when it comes to helping boost your pool’s temperature. We’ll share what we tell our clients, but first a brief explanation on how a solar cover is supposed to work. How does a solar cover for a pool work? A solar cover is basically a sheet of plastic that looks like bubble wrap and lies on top of your swimming pool. About 75 percent of a pool’s heat loss is due to evaporation. A solar cover helps reduce evaporation, thereby keeping the water inside the pool and preventing heat loss. What are the challenges of a solar cover? One of the main challenges for a solar cover is for pools that are custom shape. The solar cover must be the exact same size as the pool opening. If you have a custom size that has curves and is asymmetrical getting your solar cover trimmed to the exact dimensions is very, very challenging. You’ll also need a system for removing, storing and replacing the cover every time you want to swim. Many inground pool customers opt to use a reel to automatically remove and replace the cover. That helps reduce the time it takes you to deal with the cover, but the reel is bulking and not attractive. If you are investing in an outdoor living plan with landscaping, a reel system for your cover is probably not going to be a great fit. Are there alternatives to a solar cover? If wrangling a plastic cover doesn’t sound like a great idea, you may want to consider two possible options: heaters or liquid solar covers. A heater is a more expensive option, but it is the most reliable, effective and flexible, and it works for inground pools – like the ones Aqua Pool specializes in – as well as above-ground pools. You can use an electric heat pump or a gas-powered one. Click here for more information on heat pumps for pool, as well as potential costs for electric-powered ones. A liquid solar cover is a microscopically thin layer of alcohol that sits on top of the water of your pool. The alcohol prevents evaporation, which as we mentioned above, helps keep the water warm. Most liquid solar cover products need to be added to your pool on a regular monthly schedule in order to be effective. A liquid solar cover -- or a plastic solar cover -- can also work well in conjunction with a heater to help save you money. In general, most of Aqua Pool's clients opt not to use a plastic solar cover due to the difficulty of managing it as well as the aesthetics of it. But some pool owners do find this it works for them. If a plastic solar cover doesn't seem like a good option, you should definitely consider the alternatives outlined above. 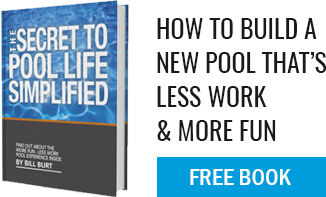 Finally, if you have questions about maintaining your pool’s temperature, or if you want to design a new inground gunite pool, just fill out the contact form on this page and one of our pool experts will be in touch as soon as possible. You can also call us at 860-623-9886 or email us at info@aquapool.com.